At Christmas time many people sing ‘While shepherds washed their socks by night’ for fun, or even sometimes by mistake. 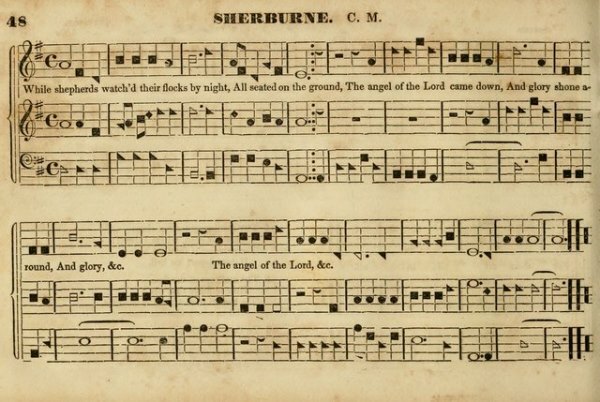 The origin of the proper words for this carol dates back to the eighteenth century. Nahum Tate (c. 1652-1715) and Nicholas Brady (1659-1726) were a pair of Anglo-Irishmen who collaborated to produce a collection of ‘metrical psalms’ which they published in 1696. It was called A New Version of the Psalms of David (‘new’ because it replaced the ‘old version’ of Sternhold and Hopkins). ‘Metrical Psalms’ are hymns based on a psalm text, but paraphrased and set in a poetic meter. Tate and Brady’s collection contained ‘Through all the changing scenes of life’ a hymn which remains popular. It is sung to several tunes: ST MAGNUS (a tune by Jeremiah Clarke); DOWNS (by Lowell Mason); IRISH (an eighteenth century Irish melody); and WILTSHIRE (by George Smart). Even more famous is Tate and Brady’s Christmas carol ‘While Shepherds Watched Their Flocks by Night’. It was first published in 1700 in A Supplement to the New Version by Dr Brady and Mr Tate. It is a paraphrase of St Luke’s Gospel, Chapter 2, and tells the story of the angels appearing to the shepherds on Christmas night. It has been sung to many tunes, but is today mostly associated with WINCHESTER and LYNGHAM.